Hydro Isolate 90 is totally unique predigested protein isolate 90% with zero sugar and fat content. No thickeners, no colorants! Only hydrolysed isolate 90%! Instant (easy to mix) enzymatically hydrolysed 90% whey protein with degree of hydrolysis DH 8 that contains 90 -94 g (depends on the flavour) of extremely fast usable amino acids in every 100 g of the product! We developed the recipes thank to these all of the flavours have really excellent taste and consistency, even though they contain almost no additives! We used no thickeners, no artificial colorants and for sweetening we used the sucralose. The advantage of enzymatically hydrolysed whey isolate is nutrient content – it contains nearly zero of carbs and fat. It is much fewer in comparison with hydrolysed whey concentrate that´s why it is suitable for cutting diet and weight loss programs too. 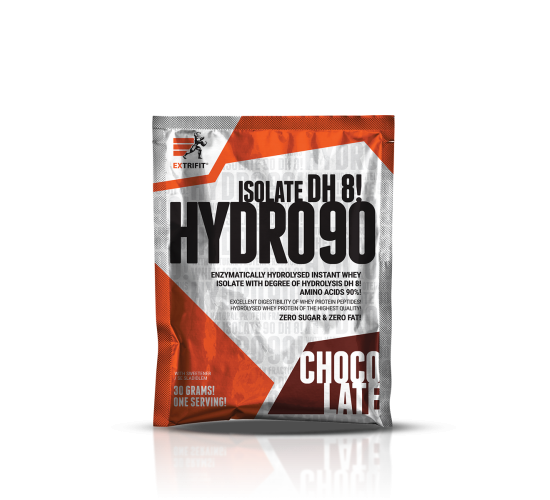 Hydro Isolate 90 is uncompromising protein supplement intended for the most demanding users. Hydro Isolate 90 contains only enzymatically hydrolysed (predigested) protein. Thanks to hydrolysis (DH 8) it has excellent digestibility and fast absorption. It does not burden your digestive system! Intake of this high quality protein can increase muscle mass growth and prevent from muscle catabolism in danger of that. Depends on physical activity, sports activity and diet. We recommend dividing the daily dose (2-6 scoops) into two or three portions. Because of hydrolysis (predigestion) is suitable to consume this product after the workout, before that or in the morning on an empty stomach. Mix 1 scoop (30 g) with 150-200 ml of water.